Known with its twist on fast food but in a healthy and intelligent manners, Uma-Bo may still be under the radar for many foodies in Jakarta but it deserves a recognition with its beautiful attempt to empower the good old rice bowl and burgers. One of its glorious selections, Ribs Me Up or Uma-Bo’s fancy version of rice bowl with slow cooked ribs will always be dear to my heart but this time I’d like to introduce one of the latest additions to the menu – Laostian 48. 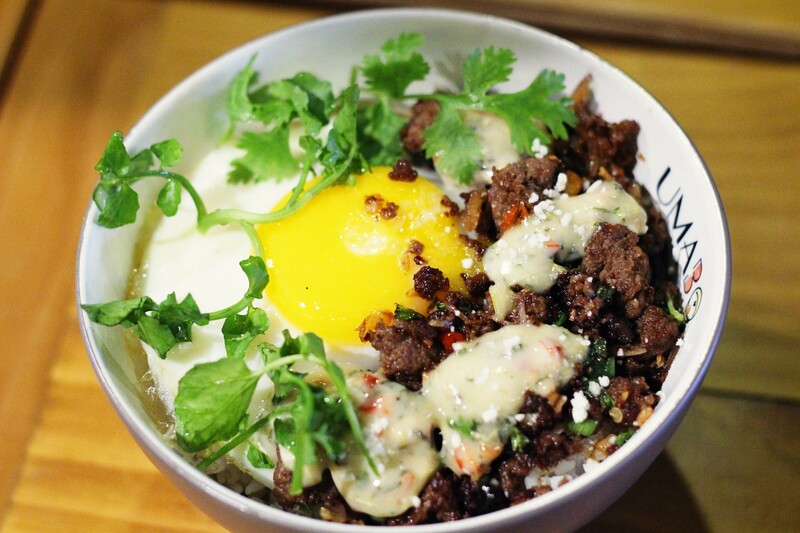 In spite of many weird (but cool) names used in the menu, Laostian 48 comprises of great utilization of beef larb and intricately woven with pickled red onions, sliced chilies, and the pretty sunny side up. To retain much of its Asian flavors, chefs Fernando Sindu and Ivan Wibowo formulated lemongrass aioli to be incorporated in the dish. To enjoy it properly, be sure to crack the egg yolk early and mix it all up with the rice so that everything remains moist, flavorful, and it will suit well with whatever combination that you can pick at Uma-Bo.